Stephen J. Benkovic was born in Orange, NJ. He received his B.S. degree in Chemistry and A.B. degree in English Literature from Lehigh University, and his Ph.D. in Organic Chemistry from Cornell University. After a period as a postdoctoral research associate at the University of California, Santa Barbara, he joined the Chemistry Department at Penn State University in 1965 and became a Full Professor of Chemistry in 1970, followed by recognitions as an Evan Pugh Professor of Chemistry in 1977 and the holder of the Eberly Chair in Chemistry in 1988. 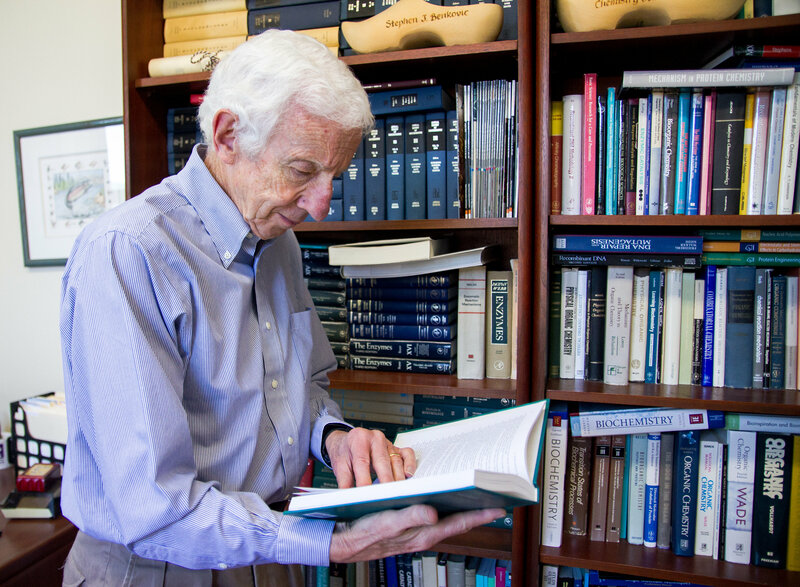 His work has been recognized by awards, fellowships, and election to memberships in the American Academy of Arts and Sciences, the Institute of Medicine, National Academy of Sciences, and the American Philosophical Society. Benkovic’s recent work has focused on the assembly and kinetic characteristics of the enzymatic machinery that is responsible for DNA replication and DNA repair inT4 phage and human cells; the importance of coupling of proximal and distal residues in the catalytic cycle of the dihydrofolate reductase enzyme that serves as a paradigm for describing enzymatic catalysis in terms of a series of orchestrated protein conformations to reach the transition state; and the assembly, disassembly, and function of an intracellular complex, the purinosome, that consists of the enzymes involved in de novo purine biosynthesis.